RF - the definitive London single-decker? 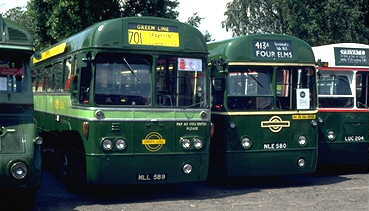 This is RF202, in company with RF580 and RF4 at the 1983 London Bus Rally, Chiswick Works. RF202, a modernised vehicle for Green Line service shows its curved screen and racy dual headlamps. This is a special vehicle because it was the last RF in London Transport/Country service. Withdrawn in July 1979, it was soon overhauled and repainted by LCBS for the Green Line Golden Jubilee, and subsequent special duties. It is still in sedate service today, with Duchybus in Cornwall, but under false identity as UVS 678 (ouch). In 1947, 50 percent of the London single deck fleet was over 15 years old. Fortunately AEC was developing a new chassis, with underfloor, mid-mounted engine. After trials with prototype UMP 227, 700 RF vehicles were ordered. The first 25 were for private hire, with panoramic glazed coving panels (see picture) and short bodies. Longer (30 feet) bodies were fitted to all the remainder, which started arriving a year later in 1951. The first batch of over 250 went to Green Line service, before red ones RF289-513 went to the aid of the pre-war vehicles. Finally the remainder up to RF700 went to the country area, and experimental one-man operation started immediately. Finally, there came 50 deck-and-a-half coaches for BEA. All the country buses were converted for one-man-operation by March 1959, and refurbishment of selected vehicles for Green Line work started in 1965. Many spare Green Line RFs were converted to OMO bus specification instead. Disposal from the country area started in 1971. Gruesome, box-shaped Bristols appeared in place of a classic coach. Ugh! Ironically, the last few RFs in service were cover for Green Line services. Now, there are probably a higher proportion of the RF class in preservation than any other major type. Long-live the RF.